Come to the rescue with Wilderness First Aid - GetGoing NC! 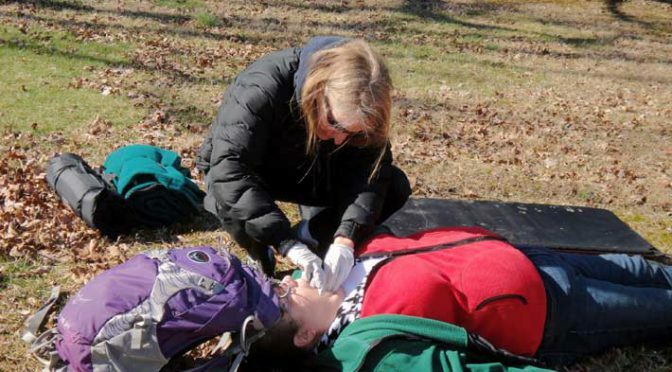 Why devote an entire weekend to getting your Wilderness First Aid certification? Imagine you’re on a trip deep in the backcountry. Someone in your group goes down, there’s a loud snap, their leg below the knee is at an angle at odds with the leg above the knee. Do you want to be paralyzed with fear because you haven’t the slightest idea what to do? Or would you rather know exactly what to do and set a rescue in motion? 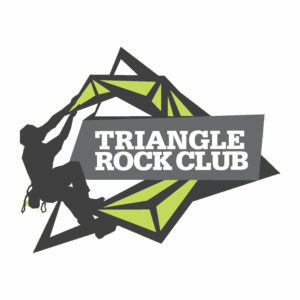 The two-day SOLO Wilderness First Aid class is coming to Charlotte March 30-31, and the Triangle/Triad area April 27-28. More about both classes and how to register at the end. First, a repost of a blog we wrote about first taking the class in 2014, to give you a sense of what you’ll learn. My weekend at the Nantahala Outdoor Center was teasingly painful: two days in the Southeast’s premier outdoors playground and not once did I hike, bike, or paddle. Looks are deceiving; that’s actually a good splint. On the other hand, it was the most enlightening outdoors-related weekend I’ve spent. Saturday and Sunday, I attended the Wilderness First Aid certification clinic held by New Hampshire-based Stonehearth Open Learning Opportunities. SOLO, as it’s commonly known, has been offering courses in wilderness medicine since the 1970s. The Wilderness First Aid course is intended to train the first people on the scene of a backcountry incident with the basic skills to deal with a range of injuries and illnesses. 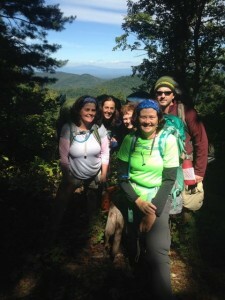 In my class of 15, most were taking the class because they take people into the woods: there were four women from a nature park in Birmingham, Ala., two river guides, the head of the outdoor adventure program for a private school in Tennessee, the coach of a high school mountain bike team in Georgia’s fledgling interscholastic mtb league, three women who work with troubled youth in outdoor settings. 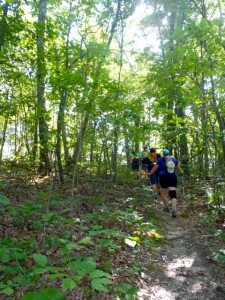 I lead weekly hikes that range from mellow after-work strolls to day-long plunges into wilderness areas. We were there because we needed to know how to deal with everything from dehydration to amputation should the occasion arise. And what to do when you find a mountain biker injured by the side of the trail. Or in this case, a fake mountain biker with a fake injury. “We’re going to ask you a few questions,” Jake, who heads the private school outdoor program, told Laura Jane, our downed mountain biker. The MO for our clinic was: classroom instruction followed by a scenario in the field. Listen, hands-on, repeat. In the Patient Assessment Triangle, our first responsibility was to make sure there were no immediate dangers in the vicinity, first, to us (we’re not much help if we’re laying next to the victim gripping our arm), to any bystanders, to the victim. Then ask if they need help. Assuming an affirmative, we then dive in with a quick patient exam: make sure their airway is clear, that they’re breathing properly, that they have good circulation. Check the length of the body for any “deformities” (breaks, fractures, anything not looking quite right), then assess the environment to see if the victim is safe staying put for further examination and treatment. In Laura Jean’s case, her “chief complaint” was her injured left arm. Was that her only issue? In the end, Laura Jean’s injury was indeed her injured left arm. Whether it was broken or fractured was the concern of qualified medical personnel down the line. Our job was to get her to those qualified medical personnel. Our main objective: fashion a splint that would immobilize her arm, prevent additional injury, minimize her pain. In fact, I got a “Nice splint!” from co-instructor Lara Christy. 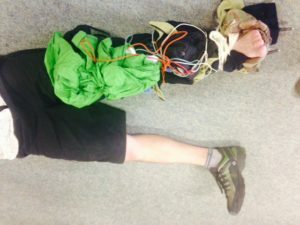 My handiwork met the splint criteria summed up in the acronym BUFF — Big, Ugly, Fat, Fluffy. Use whatever you have on hand (in my case, hiking poles, rain gear, cord, and some layers), don’t worry about looks. Much of what we learned was captured in acronyms. There’s MOI (methods of injury), SS (signs and symptoms), LOC (level of consciousness) and the related AVPU (which is not the convenience store clerk on the “Simpsons” but stands for Alert Verbal Pain Unresponsive). Some of the acronyms were forced, but they stuck. We learned to diagnose a variety of common backcountry injuries and illnesses and how to deal with them, at least until qualified medical personnel was available. Perhaps most importantly, we learned that, despite what we learned, thinking on your feet and reacting to the situation is paramount. Sometimes, there are no good options, only less bad ones. A week or so after getting certified, on an early morning run at Umstead State Park, I came upon another runner who had slowed and may have been weaving slightly (or he may have been avoiding a rutted trail). It was already in the 80s, the humidity was ridiculous. Prime conditions for heat exhaustion or heat stroke. “How’s it going?” I asked as I caught up to him. We ran together and chatted for a half mile or so as I looked for signs and symptoms: pale skin, panting (more than the conditions might warrant), incoherence.He seemed fine. But if he hadn’t, I was prepared to help. MEDIC out of Charlottesville offers SOLO Wilderness First Aid classes throughout the region. The course runs two days and the course fee, which is subsidized by Great Outdoor Provision Co., is $195. You can find a complete list of class dates and locations on their website. The next two classes are listed below, along with a link to where you can learn more. Charlotte, Discovery Place, Saturday-Sunday, March 20-21. Learn more here. 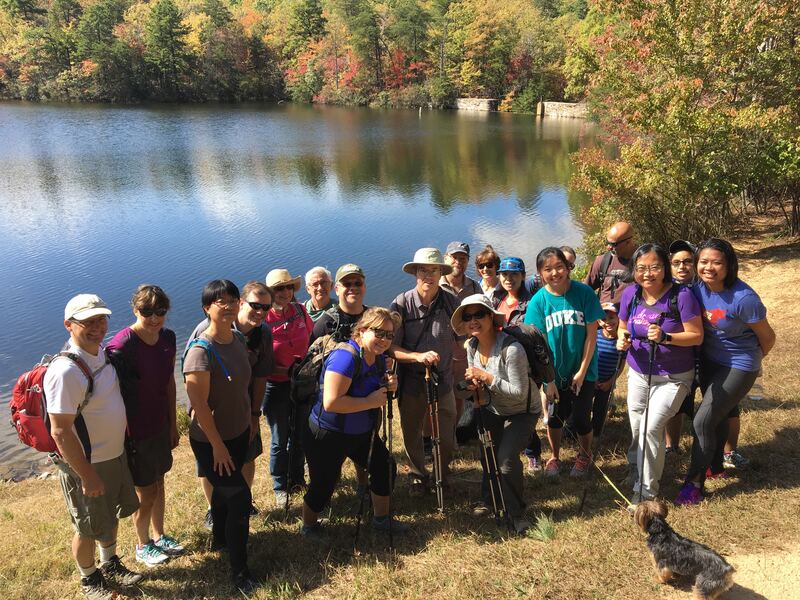 Saxapahaw, Saturday-Sunday, April 27-28, Learn more here.